A video of a woman taking groceries out of her pants to fill a trolley has left many shocked. A woman may have set a new record, and perhaps proven that shopping trolleys are just a thing of the past. A video of a woman unpacking groceries into a trolley is doing the rounds. No, the woman is not a packer or an employee at a store. By the looks of it, she seems to have been caught doing something she shouldn’t have. That still remains to be proven. The origins of the video and the woman’s details are still unknown, but the male voice in the background speaks a language that would presumably be unfamiliar to most South Africans. 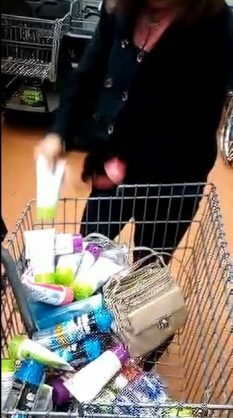 The shocking video shows her filling an entire trolley with items that were hidden on her body. How she managed to pack the items around her body unnoticed remains a mystery, and maybe the woman should be put on magician David Copperfield’s opening lineup.